It is hard to believe that 12 months have passed since the Castle Quay Weekender took place in the seven empty shops in and around the Cultural Quarter of Bedford. 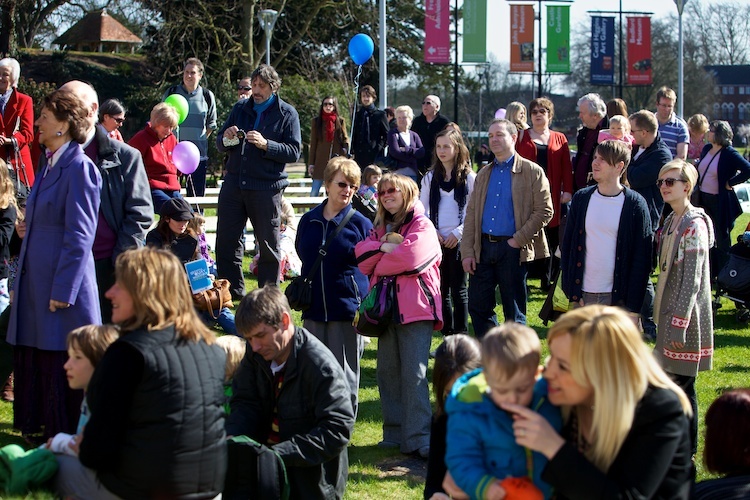 The weekend of 19 – 20 March 2011 attracted over 4,000 people to Castle Quay offering everything from live music to crafts, wine-tastings to comedy, guided tours to community art galleries. And the sun shone! When we conceived of the ‘pop up arts festival’ idea in November 2010, we envisaged one event in one shop. However, with a grant from the RSA, the backing of the Borough Council and the involvement of the private landlords, a far more ambitious event began to take shape. We Are Bedford was established as a not-for-profit community group to help us organise the event and we were amazed at the enthusiastic response from the people of the town to the project. Had we finally beaten the ‘Bedford apathy’? We were fortunate to enlist the help of design agency Bonfire CI who very kindly sponsored the branding of the event. By quickly establishing a visual identity, the Castle Quay Weekender really began to take shape and we engaged with other groups and businesses in the community to get involved too. The Bedford Swan Hotel, Esquires, Eagle Gallery, Infinite 29, Hand-made Markets, BCA, The Creative Bedfordshire Network, Bedford Tour Guides, artist Jane Edden, Cecil Higgins Art Gallery & Bedford Museum, Pensieri, Castle Hill Garage, Lady K’s, Angelo’s cafe, The Riverside Grill, John Hegley, Bedazzled, Jane Perrone, Kathy Brown, Tom Barwood, The Blue Glass, Fancy!, UOldBag!, Reestore, Hemlock Morris Dancers and a host of buskers immediately grasped our concept and worked tirelessly to make it a reality. So, what has been the legacy of the event? Well, a year on and all of the empty units are now (or soon to be) occupied with an eclectic mix of retailers, eateries and a gallery. No longer a neglected ‘cut through’, Castle Lane is finally fulfilling its potential as the Cultural Quarter of the town. While we can’t claim to have been solely responsible for this, the Castle Quay Weekender certainly contributed to raising perceptions and awareness of the area. Much of the organisation and promotion of the event was undertaken on the We Are Bedford Facebook and Twitter pages. All of it was done by volunteers. This on-line community has grown and now the Facebook group has nearly 400 members. As a forum for our town, We Are Bedford is an excellent source of information and collaboration, with many different groups and people networking together to improve and enhance Bedford. The We Are Bedford group has also spawned other projects and initiatives with similar aims. As for me, well, The Bedford Clanger would not exist if it weren’t for the Castle Quay Weekender. The people I met, the enthusiasm I encountered and the knowledge that arts and culture can and do thrive in our town made me determined to provide a platform to promote the stuff that makes Bedford great. And the Clanger was born. It’s been hard in these tough economic times, but the feedback that I have received, and the connections that We Are Bedford continues to facilitate makes it worthwhile. “The Castle Quay Weekender was a tremendous success and showcased exactly what can be done when people get together and work hard to improve their local community. Featuring music, art, comedy, workshops and much more it provided a superb outlet for local people and groups to showcase what they are all about to a wider audience. “Of course, since the weekend took place a number of new businesses have moved into the once empty units at Castle Quay. These new additions to the town centre are helping to create a vibrant new district in Bedford Borough which we can all be proud of and enjoy. I have no doubt that the superb community spirit which the Castle Quay Weekender helped to achieve was a contributing factor to these new additions choosing to come to Bedford. As an organisation representing businesses, we were delighted to see We Are Bedford and the Castle Quay Weekender blossom into motivational group for good in Bedford. What started out as a small scale pop-up empty shop initiative erupted into a weekend long arts festival due to the spirit in which it was embraced; by the many members of the public and the organisations that helped out, supported it and took part. As corporate sponsors providing design and marketing services we were amazed how each week more acts and events were added to the weekend’s growing schedule. The Castle Quay Weekender (CQW) proved one big lesson to the community of Bedford and that is with the right ideas, ethics, people, enthusiasm and perseverance you can make things happen. Over 4000 people turned up over the weekend to an otherwise little used part of the town, but these weren’t just people, they were Bedford and they came to what turned out to be a major local event – run by the people for the people. Since the CQW the local creative networks have expanded massively and long-term friendships have been forged, awareness of the local businesses in the area has been raised and it has encouraged other groups to embrace ‘pop-up culture’ locally; and more importantly it’s raised awareness of Castle Quay, Bedford’s cultural quarter, and helped fill those 7 empty shops! We Are Bedford and the Castle Quay Weekender captured the hearts and minds of many, particularly younger, people and brought them together under one community-led banner. We Are Bedford and the CQW gave people from all sectors of the community a rallying point at which they clearly felt they could become “involved” and make a difference in the town. Using social media as a way of capturing that enthusiasm, We Are Bedford showed how a fast-moving community-led project can succeed where other structure-bound organisations have failed to get Bedford moving. Since the Castle Quay weekender we have seen the area thrive from just three full units (Pensieri, Lady K’s and Ocal leather) into what is now a variety of shops and restaurants. This now bustling little quarter has become one of Bedford’s hidden gems to shop, eat and relax. The very successful weekender raised much awareness to the area that is the gateway between the town centre and the Castle Quarter.